Click to see complete April album. Singing / chanting while dancing in a circle is a dynamic meditation in movement: from high energy dances to slow contemplative walks, attuning to love, harmony & beauty, dipping into the heart of many religions, & touching the universal Truth in various spiritual traditions.. 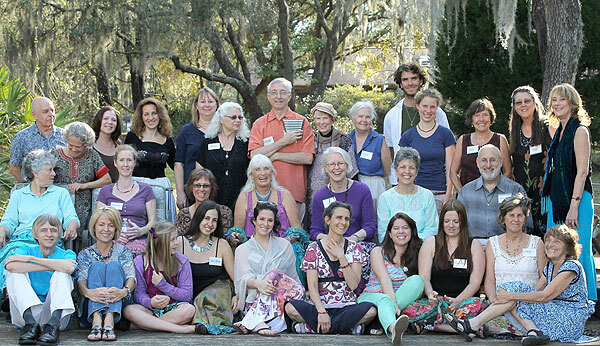 Please arrive before 3:00, to begin & deepen our energetic journey of sacred songs &practices together. Take time to be with Nature. Bring a generous dish of healthy food lovingly made or chosen consciously to nourish many people. Suggested donation $10. + $5. if you don't bring a dish. Young adults to 35 dance Free this time! Those who would like to spend Saturday night may make reservations in advance. $25 includes breakfast. 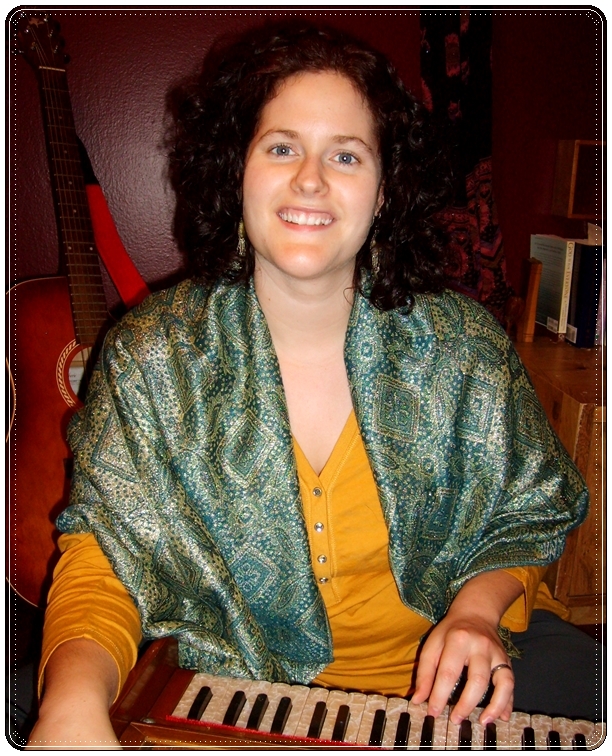 At the upcoming Dance, Rebecca Pethes has agreed to lead us in Kirtan as a prelude to zikr. Kirtan is a very simple form of call-and-response chanting of mantras or other devotional texts - a powerful way to meditate - it helps us to quiet our minds and open our hearts as we sing together. Although Kirtan has its roots in India, Rebecca draws from many sacred traditions and puts her talents as a singer-songwriter to use in creating her own devotional chants. Chanting together creates a powerful renewing and transformative energy that assists us in reconnecting with the Divinity that resides within all of us! Rebecca may also offer a session on Vocal Training on Sunday morning in the lakeside Gazebo if people let her know they are interested in advance! She is offering us an amazing low price. As a holistic voice teacher, Rebecca Pethes combines her training in Classical vocal technique with Eastern practices of pranayama (yogic breathing) and sound healing. Rebecca holds a Masters degree in Vocal Performance. She is a multi-genre performer,a voice teacheratthe Academy of Music & Art in Gainesville, Floridaand a yoginistudying at theInspiration Yoga Institute. Participants will learn vocal exercises to increase breath support and resonance, as Rebecca guides you through toning and chanting practices to open and balance the chakras. We will chant and sing uplifting songs together, and end with a Dance of Universal Peace. Give yourself the gift of some energetic spring cleansing! 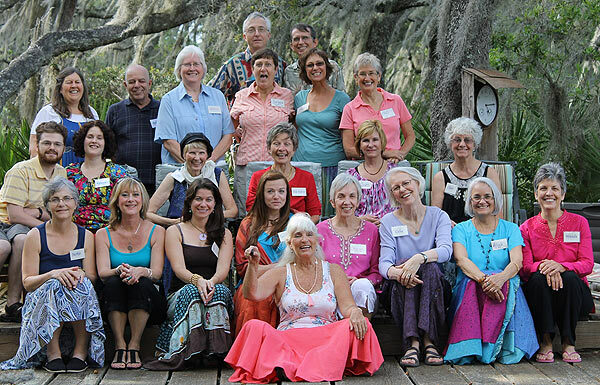 "This is the Breath that Counts "
Join our large, friendly group for dancing, laughter, music, zikr, Sufi teachings, choir, prayers, companionship & joy in a beautiful, warm Florida setting. The long weekend will be followed by a more intimate music and dancing day for leaders, musicians, and dancers at nearby Dancing Peacock Paradise on Monday , Oct. 21. You will receive an email when it is open. Be ready to pounce! Aloha means love or compassion, & is also used for Hello & Goodbye. 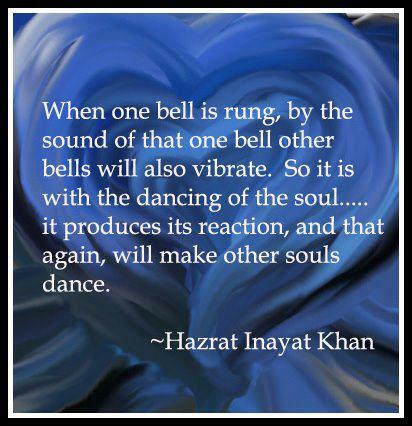 Its true meaning is reflected in the syllables "alo" and "ha" which literally translate "in the presence of the breath." In ancient Hawaiian times this greeting was spiritually acknowledging the presence of spirit in the breath, and a traditional greeting was done by gently touching foreheads while putting hands on each others upper arms and exchanging breath. "Hu" in the song is not Arabic, but Hawaiian. The whole song relates the upwelling of big Aloha energy to the sea and its waves. As a Dance leader living in Hawaii, I will share my thoughts on "Me Ke Aloha." This dance was created in the mid 1970's by Yakzan Valdez. There is a rich tradition here of song writing where Hawaiian lyrics are combined with English ones, so the concept of blending two languages (in this case with Arabic) is well established. The melody to this dance was "borrowed" from a very famous children's song composed by Nona Beamer. My feeling is that she would be happy to share it since the purpose of the dance is generating love. Personally I hope this dance continues to be shared for it always creates a gentle, loving, and sweet atmosphere. In 1989 I joined the faculty of the College of Central Florida, where Karen Williams was a counselor. When someone mentioned she was a "Sufi" I pursued her friendship. She referred to the writings of Pir Vilayat, and took me to "Sufi Dancing" in Gainesville, where Sidiqq and Majid (John and Sylvia Middlebrooks) were leading. Karen and I shared many adventures in Florida before she moved to the Big Island in Hawaii and married a Hawaiian, Mike Leialoha. In telephone calls, she mentioned her wonderful dance leader Lila Flood, whom I had never heard of until then. 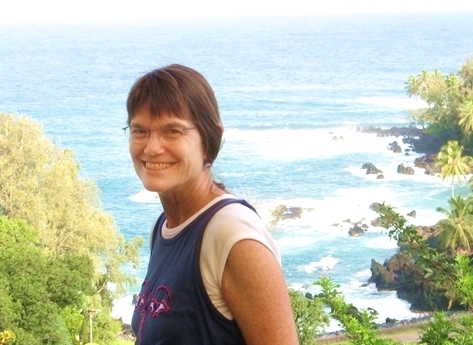 When my husband died in 2000, I went to Hawaii to spend Christmas with my dear, compassionate friend Karen, and she took me to Volcano to meet Lila, whom I immediately liked and admired. Lila invited us back for Christmas day for more dance sharing, and I invited her to lead a retreat at Peacock Paradise that spring. Since then, Karen and I have attended several Hawaii Dance Camps together. Her calm energy and accepting attitude bring peace to all that come near. Her interests in nature, skin diving, baby dolphin tending, tennis, and spirituality keep her busy and interesting. She had a treehouse built in the forest near Lila's house to do art and meditation. I am continually thankful to Karen for her loving friendship and especially for introducing me to the Dances of Universal Peace, which have brought momumental changes into my life. I just wanted to let you know that Aurora & I were completely moved by the dance. I have 3 daughters, Aurora is the oldest; she & I have had a difficult relationship over the years, especially last year due to some tragic events. I've been working on healing the relationship & it has improved slowly. Nevertheless, something spiritual happened to us that magical Saturday. We haven't argued once since then. Aurora is much more affectionate with me, & we get along better than ever before. I know this transformation is a result of our experience with all of you. I consider our new relationship a miracle as the result of the prayers in recitation, song, & dance. On the way home that night Aurora said that this was the best day of her life. The first two people in the world to sign up, since this program was announced last month are our own Lee & Rebecca! The mentoring process focuses on deepening in dance support & attunement, rather than specific instruments. In addition to the presence and guidance of a mentor, (in this case, DiAnahita) the program gives access to printed articles about dance musicianship as well as on-line dance music & audio files. DUP International extends best wishes & thanks to all musicians who play for the Dances of Universal Peace! Ya Fattah! 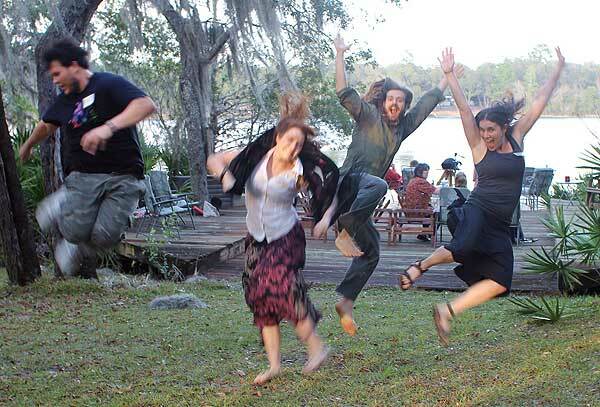 will be at the Florida Fall Retreat again to lead us in Turning Whirling Dervish style ~ and in early morning Qi Gong. Newsletter carried a photo of the Gainesville, Florida, New Year's Eve dance musicians at the top & the huge circle of dancers at the bottom. & a picture of DiAnahita leading, accompanying her article about attracting people to the Dances. Before anyone arrives, the place has been prepared indoors and out, the program composed, the event publicized, and the music practiced; yet there are still things to do during the day of the Dance. are asked to offer a brief time of service while here. Doing jobs together builds self-esteem, develops friendships, & garners gratitude. Help is needed for: Registration, Potluck setup, Dinner cleanup, Kitchen cleaning, Dessert setup, Dessert cleanup, Welcoming newcomers, Lighting candles, Filling water dispensers, Making coffee, Breakfast setup (overnight guests), Carrying out Compost, Sweeping. Help would also be welcomed in advance. It takes a team to have events like this happen. You can volunteer when you RSVP or on-site. Thank you! I had such a wonderful time with you all this past weekend. I felt like a child again exploring your wonderful property & it was so very refreshing to meet such graceful & welcoming souls. It really felt like going home!! It was such a inspiring day & I very much look forward to returning at the end of this month & the opportunity to stay overnight this time. My heart is filled with excitement at the thought of visiting & dancing again everyone. Click above to view a lovely Dance video produced by our Latin American friends.